Win! 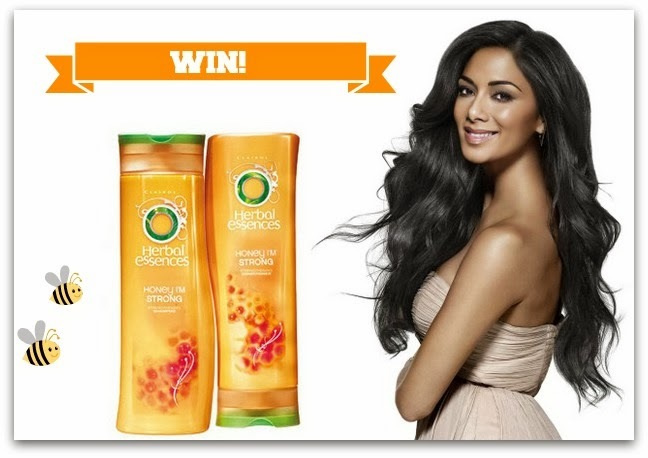 A fabulous hamper, packed with the Herbal Essences Bee Strong Collection! We all sometimes need a little pick me up to help us look and feel like the strong and powerful women we are. The new Bee Strong Collection from Herbal Essences contains natural honey and indulgent apricot scents, to add silky softness to hair (read my review of the range). Now Fluff & Fripperies has teamed up with Herbal Essences to give one lucky reader (resident in the Republic of Ireland) a hamper backed with the Herbal Essences Bee Strong Collection. The Bee Strong range is buzzing with a shampoo, a conditioner, a strengthening intensive mask and a strengthening cream for strong, shiny, glossy hair. The new strengthening cream, a leave-in treatment, works by helping repair the protective outer layer of each strand of hair to leave it strong against combing damage. The Bee Strong collection has been formulated specifically to help repair the protective outer layer of hair, leaving you with silky hair. Deeply moisturised and protected hair (that happens to smell like heaven) is more resistant to damage caused by combing, brushing and using heated tools. So goodbye breakage and split ends! Hello, beautiful strong hair! Feel the strength with the new Herbal Essences Bee Strong Collection: the recommended retail price for the shampoo and conditioner are €2.65 for 200 ml and €5.25 for 400 ml (RRP is at the sole discretion of the retailer). *Herbal Essences ‘Bee Strong’ shampoo and conditioner strengthen against combing damage vs. non-conditioning shampoo and are now available nationwide in your local retailer. If you're resident in the Republic of Ireland and want to try out the range, pop your details in the widget below! oh how i would love silky hair! Would love this - my gruaig needs all the help it can get! ahh this is sucha lovely giveaway, these products sound fantastic! Good luck to the entrants, would love you to do a comp that is open to the whole of the UK. Theres nothing nicer than trying out new hair products, if only i could have Nicole Sherzingers hair too..
Great prize, I've been wanting to try this range for a while! My hair definitely needs some tlc at the minute, it's so frizzy and dull, I hardly know what to do with it! I love herbal essences products- I am using bee strong and highly recommend it- lovely texture and divine smell. Loving the sound of this collection, the intensive mask in particular! I find to so strange that this brand isn't available here, i always wanted to try it. Great giveaway, good luck everyone! I love Herbal Essences! thanks for the chance! I've been smelling this product every time I see it in a shop, so if I won, my cheapskate self would be very happy I won't have to buy it! Their products smell good enough to eat! Nom! Sounds amanzing - would love to try it.